Merry Christmas everyone. This is a bit late, but in retrospect, I hope you all had a wonderful Christmas. Claire and I had a very good Christmas. Well, within a week we soon discovered one problem with our tree - it doesn't smell. It seems that the whole hype about "no drop" trees has taken away some of the joy of having a real tree. Picking up pine needles until July is no fun, but the smell was wonderful with our last tree. It appears spruces don't produce any smell. Oh well, we'll remember that for next year. Christmas this year was at Claire's folks house with "the kids" providing all the food and doing all the work. We went over on Christmas eve and got cracking with the prep work that night. I'll spare you all the details on the prep work, but thanks to Claire and a lot of help from Ian, all was piping hot and ready for a hearty lunch on Christmas day. There was absolutely tons of food. Starters were little smoked salmon fillet tarts decorated with a little bit of smokes salmon. The main meal was turkey, home-made stuffing, ham, sprouts, carrots, parsnips, roasties and brocoli served with proper gravy made from the turkey juices and giblets. This was followed by Christmas pudding and cream with a nice dessert wine and followed by cheese & biscuits and Port followed by a game of Trivial Pursuit and then bed time. It's amazing how time flies when you're having a good time. That pretty much sums up Christmas, the only exception is presents. 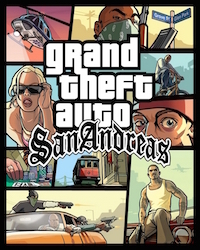 Claire broke the "we're not spending lots on presents this year" rule and bought me the new slim-line Sony Playstation 2 along with what has got to be the game of the year, Grand Theft Auto - San Andreas and the official guide to the game to get me going. I was like a little boy again with a huge smile beaming from ear to ear. I was not expecting this at all. Granted I had mentioned it a lot, but I wasn't expecting Claire to get it for me. I got Claire a fantastic set of 100% pure cotton flannel pyjamas and a top-up for one of the perfumes Claire used to wear a lot. Mum got us a lovely "Scottish" hamper containing shortbread biscuits, oat cakes, fudge toffee, duck pate, fruit loaf and a bottle of red wine presented in a lovely wooden basket. All in all, we had a great Christmas with lots of food and cheer.